Well, I'm embarrassed. Turns out that the "big drop" in high-priced inventory we saw over the last month was due to a recently made error in my code, and did not occur in reality. 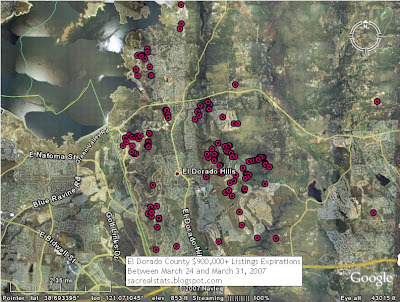 This same error has led me to understate overall inventory and prices as well, with the most effected being El Dorado County. I will spare you the technical details on why this happened, but rest assured, the error has been corrected. As you can see, El Dorado County inventory has actually been increasing more rapidly than the other counties over the last month. I'm leaving out the weekly change data this week since it's too distorted to be of any value. Thanks for bearing with me. The more complicated my code becomes, the easier it is for errors to creep in. If you have any questions about the details, or what the previous four weeks of data should look like, send me a email or write a comment. At 15,066, four-county inventory is running 15.3% higher than last year at this time. Although overall flipper inventory is still lower than its peak values from summer 2006, it now stands at 21% of the market. Nearly 10% of all listings in Sacramento County had a price reduction last week. Overall inventory is running 17.6% over last year at this time. The all-time high for the $200K-$300K range in Sacramento continues to grow, but we are starting to see movement in the $350K-$400K range as well. The slight increase in El Dorado is probably due to some of those expensive listings coming back on market. Sippn and others have brought up the fact that many of these "flippers" are really bank REOs. Although it is impossible to say for certain on each individual listing, it should be possible to parse out aggregate REO data using certain filtering criteria. Once I work out the kinks, we should have a slightly clearer picture of what the market is up to. - Rollingwood was bought by a "Pismo Beach developer" and "Condominium conversion maven" by the name of Al Nevis for $39.4M, or $144K per unit. - The Nehemiah Sacramento Valley Fund (a non-profit run by Pacific Coast Capital Partners) sunk $5.5M into the project also. - One of Nehemiahs subsidiaries runs a downpayment assistant program for low-income buyers. - In May 2006, the IRS ruled that seller-funded down payment assistance programs do not qualify as tax-exempt. - According to the article, sales at Rollingwood almost completely dried up after that ruling. Coincidence? Can anyone confirm that these buyers received "assistance" from Nehemiah? Also, does anyone have any insight into how profits from this deal were split between Nehemiah and Nevis? How much of the profit escaped being taxed? All of these articles have personal stories of how the bubble collapse has directly affected someones life. All of these reporters took the time to put a national story into a local context. Rarely does this happen in Sacramento. So, I'm putting the call out. If anyone has a personal story to share about the housing bubble, shoot me an email, and I'll publish it here. If you wish to remain anonymous, that's fine too. It's time to put a human face on this. 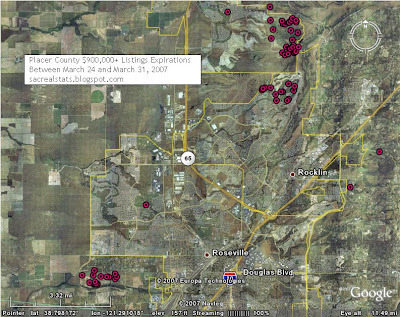 Our latest in the Distressed Properties series shows some very interesting results. We see that distressed properties went up from 2,136 in March to 2,598 in April, representing a 21.6% increase in just one month! Inventory rose from 13,416 homes to 14,932 homes, a 11.3% increase. Worth pointing out is that in the last 30 days, we saw 1,557 homes sell. That calculates into 9.6 months of inventory right now. Back in January I predicted a 17% peak for distressed properties. Looks like I underestimated the market! Also, changes in Sacramento County asking price data are being driven almost completely by the huge increases in $200K-$300K inventory. Houses in that price range now make up over 26% of all listings, and are well above last year's peak. At the rate things are breaking down in Sacramento, all flippers there will be FITs by October, unless something gives. While everybody is marveling at the February uptick in the latest NAR report, we at Sacrealstats are already in March. Here are the latest monthly sales graphs, with data courtesy of Agent Bubble. As you can see, last months good news was short-lived. Prices are down 8.4% from last March, and 11% from the peak. 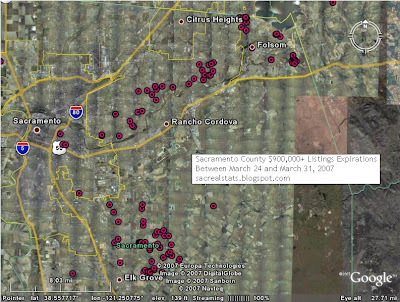 A fellow by the name of Dimitris has started up a blog tracking Countrywide Financial's REO inventory, and I thought it would be interesting to see how CFC is doing here in Sacramento. Once I was aware of these data, I became very interested to discover what CFCs approach was for ridding itself of these houses. Boy, was I surprised. Although this is a relatively small data set, it does betray an undercurrent in this market that has remained pretty well-hidden until recently. How many other REO holders are keeping back inventory? How long can they hold out before they're forced to sell? One thing's for sure: A third player is about to enter the Sacramento market in a big way. As a companion piece to this post, I put together a bonus Countrywide Edition over on the Flippers In Trouble blog. Enjoy. 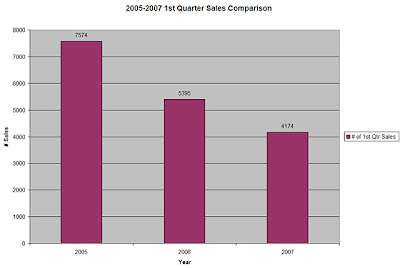 Let's take a look at the sold stats from the first quarters of 2005-2007. 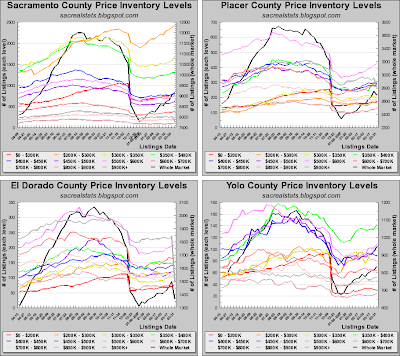 I compared stats for all four surrounding counties (Yolo, Sacramento, El Dorado, and Placer). The interesting thing to note here is the increase in sales that typically occurs from February to March. In 2005 and 2006, we saw increases of 53% both years. However, in 2007, there was only an 11% increase. 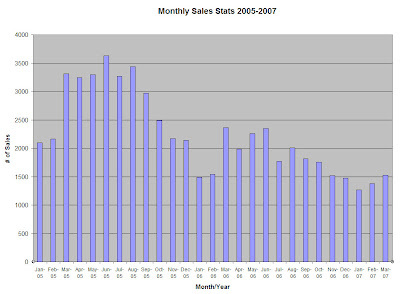 Also worth noting is that for 2005, the highest sales month was June with 3,627 sales and for 2006 it was March with 2,366. 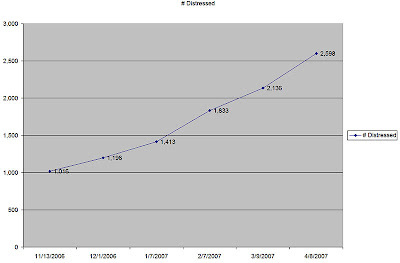 Think about what this means for 2007 if we're only at 1,528 sales in March and March has typically been the highest (or very close to it) month of the calendar year. 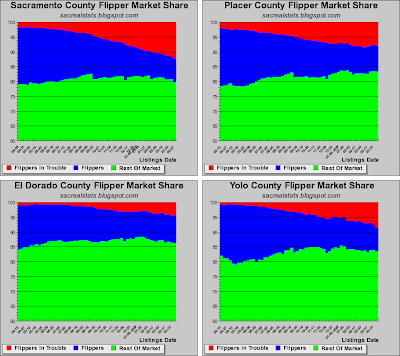 Although the listings were highly clustered in El Dorado and Placer, only 39 of the 362 listings are two-year flips. Are these just people trying to get lucky, and failing? Are they investors with a 2+ year time horizon? Are they builders trying to offload newly built spec inventory? Will they re-list by next week to get in on the hot spring selling season? Stay tuned. As you can see, we are clearly in the earliest stage of what could become a major credit event that could continue for the next several years. How many people have ARMs in this town? How many people cannot afford their newly adjusted payment?